Price: $3,219 Free UPS 2nd Day Air Shipping! 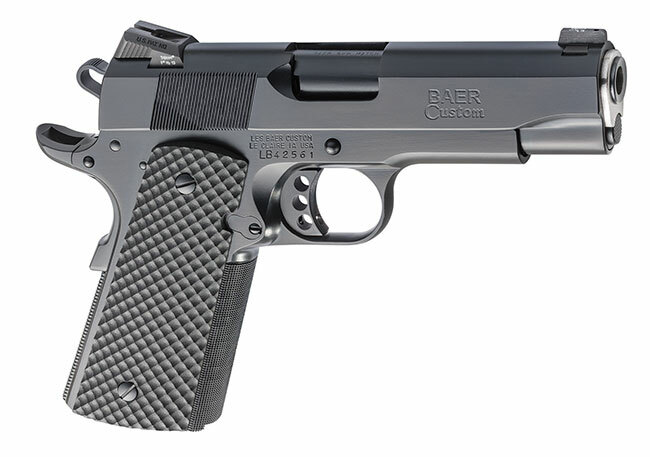 The top of the line Les Baer 1911 Ultimate Master Combat 6” Model is a full house competition model that’s built to go racing. It comes equipped with Les Baer 6″ slide, and it’s guaranteed to shoot 3″ groups at fifty yards. Baer NM steel frame and NM slide with blued finish • Baer NM 6″ barrel and stainless steel bushing • Low-mount LBC adjustable sights with hidden rear leaf • Baer dovetailed front sight • Double serrated slide • Fitted slide to frame • Lowered and flared ejection port • Two-piece beveled mag well • High checkered front strap @ 30lpi • Checkering underneath trigger guard @ 30lpi • Serrated rear of slide @ 40lpi • Serrated top of slide • Baer deluxe Commander hammer and sear • Baer extended ambi safety • Tuned extractor • Baer extended ejector • Baer checkered slide stop • Baer beavertail grip safety with pad • Baer tactical mag catch • Baer speed trigger with crisp 3 1/2 lb action job • Polished feed ramp and barrel throat • Baer Premium Checkered grips • Tuned for total reliability • Blued finish • (2) 8-round premium mags. Caliber: 9mm w/supported chamber allowing for all range of 9mm loads including “hot” loads. Price: $2,829 Free UPS 2nd Day Air Shipping! The long anticipated Les Baer 10mm Premier II in 5in! The 10mm Auto cartridge is one of those rounds with a cult following among our customers. The 10mm is having increasing popularity with shooters looking for the ultimate balance between power and control. 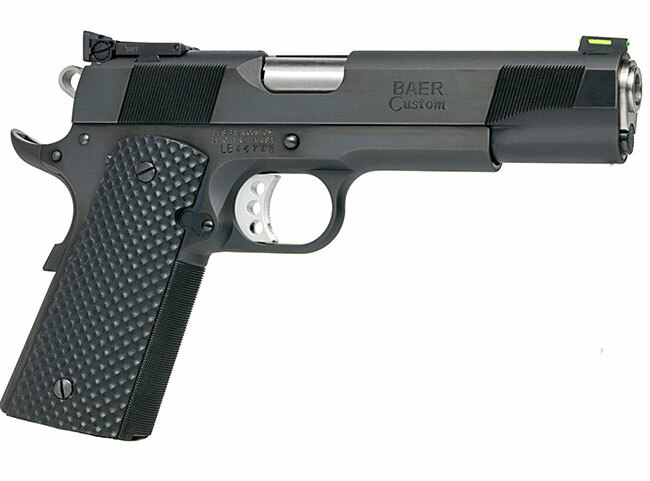 So when we learned that Les Baer Custom was making a 10mm Model 1911 we ordered several. 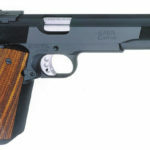 Les Baer Custom 1911s are some of the best-crafted, tightest-fitting and accurate 1911s you can buy. The new 10mm pistol is part of Baer’s Premier II line. 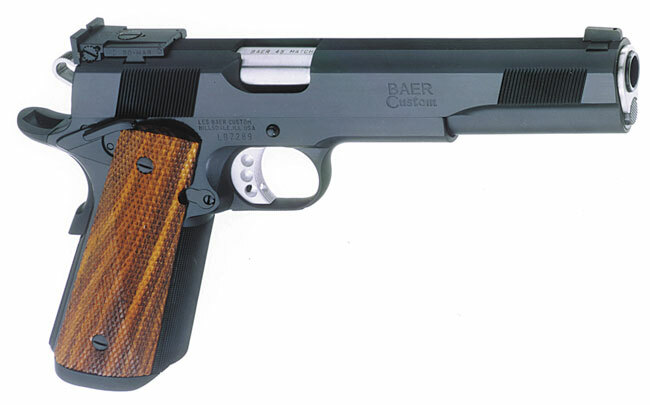 It has Baer’s throated and fully supported National Match 5-inch barrel and slide. It has a steel frame, a stainless-steel bushing, a low-mount adjustable rear sight, ambidextrous safety and a fiber-optic front sight that’s dovetailed into the slide. The chamber of the Premier II 10mm’s 5.0-inch match-grade barrel is throated and fully supported. 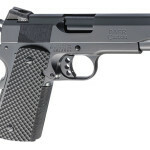 The pistol is meticulously fitted; producing the tight slide-to-frame fit that Les Baer Custom pistols are famous for. The pistol also has a tuned and polished extractor, extended ejector, checkered slide stop, extended thumb safety, aluminum trigger, deluxe skeletonized Commander hammer, and deluxe sear. It comes with beavertail grip safety and flat mainspring housing. The Premier II’s mag well is beveled, and its frontstrap is checkered 20 lines per inch. 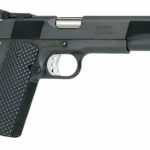 The pistol is tuned for total reliability it comes with G10 grips and two, nine-round magazines with polymer base pads. The pistol’s fit, finish, and hand-craftsmanship are excellent. Its rich black finish is evenly matched over the entire gun. Every part matches. Baer 1911s are known to have extremely tight fits. This one is no exception. Some effort will be needed to work the slide due to the close fit of the slide and frame but it will work perfectly from round one and will get easier after break-in. All edges and corners of the Premier II 10mm are smooth. The front sight has a green fiber-optic insert additional red and yellow rods are included so you can easily switch. The adjustable target-type rear sight has the top two corners have been rounded off to prevent snagging. The face is all black and finely serrated, and the whole unit has been recessed into the top of the slide. The frontstrap is checkered 30 lines per inch; the G10 grips are textured; and the flat mainspring housing is serrated. Together they provide a secure grip without biting into the shooter’s hands. Our pistol has an ambidextrous thumb safety (extended in the right-handed shooter side) and a standard magazine release. The grip panel has been sculpted to allow easy, quick access to the magazine release. The skeletonized aluminum trigger is Baer’s Speed Trigger, which has three holes and a slightly oversized trigger pad pre-adjusted to 4lb. 3) chambering in a caliber that offers higher magazine capacity than most 1911 style pistols but that still delivers ample stopping power in emergencies and is readily available in many factory loads or as components for reloaders.